A commonly encountered jumping worm, Amynthas agrestis. from Japan and Korea are known in North America north of Mexico, in four genera Amynthas (10 species), Metaphire (4 species), Pithemera (1 species), and Polypheretima (1 species). The taxonomy of these genera is in a state of flux and at this time we do not know exactly how many species there are in their native Asian habitats. 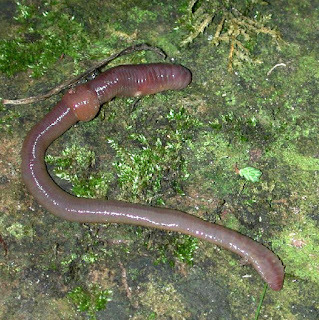 They can be differentiated from the more common European earthworms (13 species from 8 genera are known in Minnesota), including the often seen nightcrawler (Lumbricus terrestris) and rose angle worm (Aporrectodea rosea), by their annular clitellum (band around the worm about 1/3 of the body length back from the head), which is smooth and constricted, as opposed to the swelled saddle-like clitellum of European earthworms. European earthworm (nightcrawler), Lumbricus terrestris. Of the 16 species present in North America, a few species of Amynthas and Metaphire are most common in the Great Lakes and northeastern U.S. The jumping worm A. agrestis, has been found from Wisconsin and Minnesota across to New England. Metaphire hilgendorfii and A. tokioensis have similar geographic distributions, and A. loveridgei was also reported in Minnesota in 2002. Amynthas worms have been found in several places in Minneapolis. Another as yet unidentified species found on St. Paul campus of the University of Minnesota is about four inches long and chocolate brown with a metallic sheen. Note, however, that little is known about distributions of these earthworms within Minnesota, as compared to European earthworms which have been the subject of many studies. Studies of earthworms from Asia in Minnesota are just beginning. Although one of the species present in North America can live more than one year (A. corticis), for the most part, jumping earthworms are annuals. In other words, they hatch from cocoons in the spring, grow rapidly and exist as mature adults from early summer to fall, and die during the winter, after laying plenty of cocoons—which are much more tolerant of temperature and moisture extremes than the worms—to hatch the following spring. This contrasts to the European nightcrawler that hibernates several feet down, below the frost line, and lives several years. 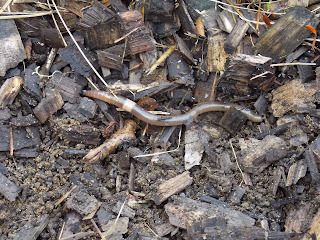 Jumping earthworms are apparently being distributed in mulch (both commercial and from community compost piles), are known to be able to survive in shredded pine, cedar and spruce mulch, and have been frequently observed in mulched garden beds. Some species have a lignin-eating enzyme called peroxidase, which allows them to eat fibers of wood in mulch. 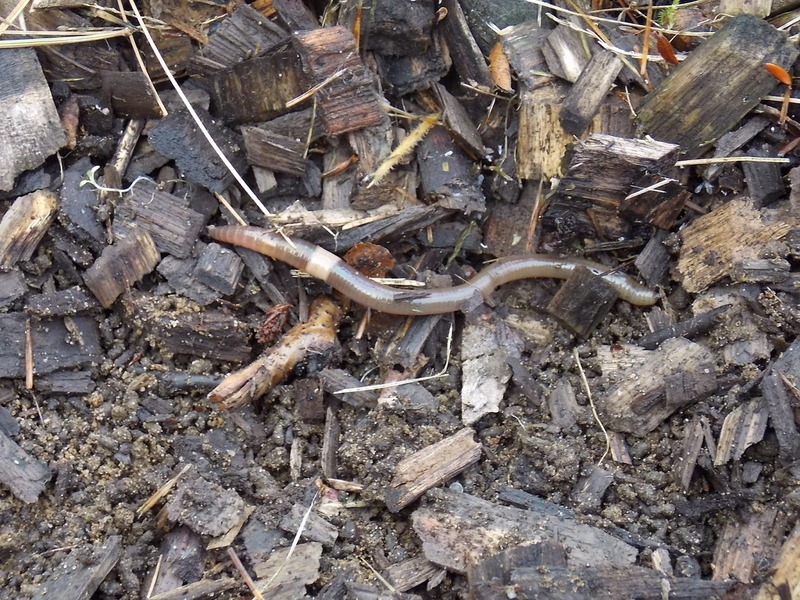 Because most commercial mulches are heat treated to temperatures that are lethal to earthworms and their cocoons, it is a mystery as to how the jumping earthworm contamination into mulch occurs. This route of distribution contrasts with European earthworms, which originally arrived in ship ballast and potted plants, and are now spread across the landscape in potted nursery stock and into even remote areas as live fishing bait. The previously mentioned A. agrestis worm can be very large - the size of nightcrawlers - six inches or more long. A. agrestis worms occasionally swarm in one area and can tear up the soil. Several years ago, a swarm of them destroyed a garden bed with hostas and other plants in Loring Park in downtown Minneapolis. When I examined the wilted hostas, I was surprised to find that they were not attached to the soil. The worms had turned the soil into pellets like cat litter and jumped every direction when I stuck my finger in the soil. Occasional irruptions with very large populations coupled with swarming behavior lead to concerns about damage to gardens, lawns, nurseries, and native plants in natural areas. The Minnesota Department of Natural Resources (DNR) has convened an Amynthas working group to examine the known information about jumping worms and to make recommendations to the DNR leadership if there are particular regulations that make sense. The working group is composed of stakeholders such as representatives from the Minnesota Nursery and Landscape Association, the Minnesota Department of Agriculture, University of Minnesota, DNR Fisheries division, and DNR Ecological and Water Resources division. The DNR continues to stress to boaters and anglers to dispose of all unwanted bait in the trash can.